‘I’ve always been a workaholic, like to the extreme. 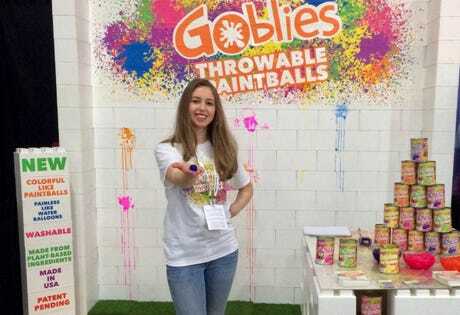 The work part doesn’t bother me,’ explained Briana Gardell, founder of Mezzimatic LLC, which makes a throwable paintball affectionately called a Goblie. ‘I’ll work a 15-hour or 20-hour day without an issue just because I know that I can walk away from my desk at any time and do whatever I want. That’s what I tend to do.’ To get a mini-recovery break, Gardell will watch some YouTube videos or go to the grocery store to get some food or pick up lunch. That 15 or 20-minutes is all she needs to reenergize. Gardell says she’s always been a workaholic, including her school years. You could say it’s reflected in her grades. Try a 3.96 undergrad GPA and a 4.0 grad GPA, both from Lehigh University, which she attributes more to hard work than being super smart, not that she’s short in the brains category. It was during her graduate studies (Masters of Engineering, Technical Entrepreneurship) that she invented Goblies, which has gone nationwide. What is striking is that Gardell would like to eat and exercise right … but only to be able to handle more work and more stress. Yup, she’s a quintessential entrepreneur. Like others we’ve talked to, that desire to be an entrepreneur goes back to when she was much younger. ‘I’ve always wanted to be an entrepreneur since I was in high school when I wrote my first business plan for a class,’ Gardell explained. ‘I was just really attached to it, and that wasn’t necessarily logical, because for a long time, I felt like saying I wanted to be an entrepreneur was like saying I wanted to be a rock star but I didn’t even have a song. Circling back to those 15 or 20-minute recovery breaks to watch YouTube videos or grab some food, we wondered if this workaholic had taken any weekends off or even a vacation since launching Goblies. ‘I’ve noticed one thing about the quality of life thing,’ she answered, ‘I’m definitely afraid of making plans over the weekends because I’m not sure what’s going to come up or how much work I have been able to get done, so I’m kind of hesitant to make plans.’ At the same time she acknowledged that post-college you have to make plans with friends ‘because you can’t just walk out your door and there are all your friends.’ She has taken some weekends off, to see her old roommates, for friends’ graduations, and now weddings. But you get the sense they are far and few between over the last two and a half years.